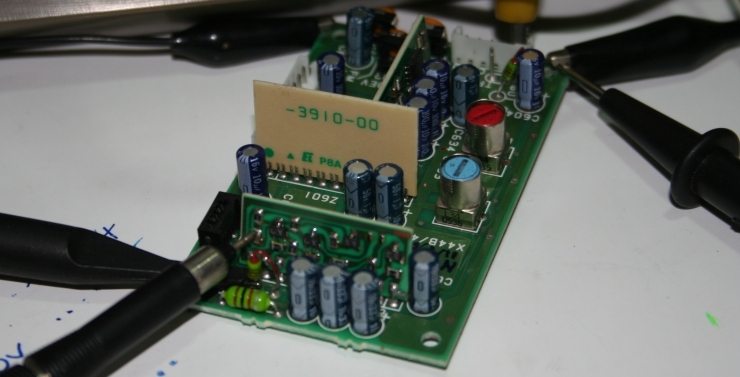 Here are some simple modifications and repairs for the Kenwood TS850s HF transceiver. Don’t be fooled: I’m not an expert in TS850s’s and I have no professional training or qualifications in electronics. I am indebted to those who prepare and share technical mods. I’m just an amateur. 2. Memory backup replacement - do it now before it fails and leaks! The rules for RSGB National Field Day allowed the use of a second receiver but (at least in Restricted Section) just one antenna. The second receiver could be used as a "spotter", for example to keep an ear on 28 MHz for sporadicE openings, or to check whether there is sufficient activity on another band to justify a band-change. In the absence of a top-of-the-range transceiver with a second receiver built-in, I was prompted to make following modification to my TS850 such that a separate external receiver could be connected to the single antenna, yet be disconnected automatically when the TS850 transmits. A medium (e.g. “number 2”) cross-head (Phillips) screwdriver. A second receiver ... this mod does not magically convert the TS850 to a true dual -receiver rig like the FT1k, TS2k or K3, it merely provides an antenna output on receive to feed a separate external receiver. NOTE: proceed at your own risk. This mod involves a fairly delicate soldering operation so DO NOT ATTEMPT THIS unless you are competent and confident at soldering. Or you are willing to knacker your beloved ’850. Switch off the power and disconnect all external leads to the rig. Clear a space on the table in which to work. Remove 11 cross-head screws (3 on each side, 2 front and rear on the top, and the last one centrally on the top panel - don't remove the 4 screws holding the loudspeaker to the top panel!). Keep the screws safely in a container to one side. Carefully lift the top cover until you can reach the loudspeaker cable - remove this by pulling off the small white plastic plug from the socket mounted on the printed circuit board under the loudspeaker. It is probably easiest to turn the radio so the rear panel is towards you. Remove the metal lid from the TX output bandpass filter unit in the middle at the rear of the TS850, with a black rubber section attached (which normally insulates it mechanically from the top panel). There are 7 cross-head screws to remove. Carefully disconnect the two coaxial cables by pulling out the miniature push-fit plugs from the board-mounted sockets, and pull out the white plastic plug connecting the control wires to the board. Unsolder the SO239 socket from the board - both inner and outer connectors need to be unsoldered - and lift out the board. This is the fiddliest part of the job - get help now if you are not confident at soldering ! Solder your short piece of miniature coax to the underside of the TX/RX relay board, in parallel with the TS850 receiver output connector labelled "RAT CN6". The coax should preferably exit to the rear of the board so that it will pass directly through the TS850 rear panel when reassembled. The coax centre conductor should be soldered to the "RAT CN6" pin nearest to the small coil labelled "L13", and the braid to the adjacent (centre) "RAT CN6" pin which is earthed. Check carefully that the joints are good (shiny and clean), and that no solder blobs or flakes remain on the board. Pass the free end of the new piece of miniature coax out through the gauze on the rear panel of the TS850 - you may need to enlarge a hole in the gauze slightly, but the coax should be a fairly tight fit. Replace the TX/RX relay board in the radio, pulling the miniature coax through the rear panel as you do so. 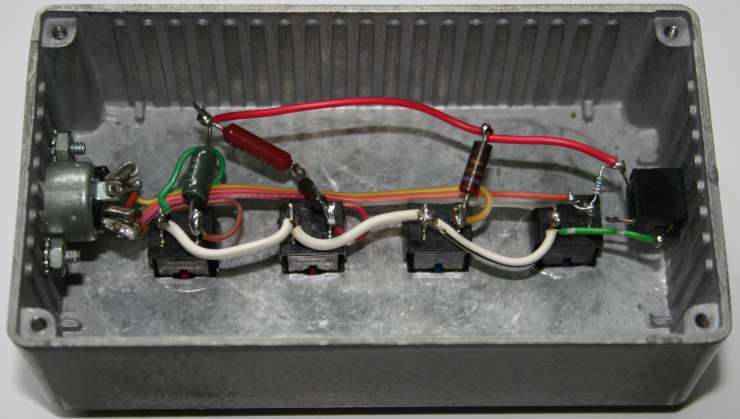 Reconnect the board by reversing the instructions given in section 4 above - connect all three leads (two coax leads, one 3-wire lead - the plug is polarised such that it is only possible to connect it one way, namely with the red lead towards the 1k ohm vertical resistor) and don't forget to solder the SO239 back on to the board. Once again check that your solder joints are good and no wayward blobs of solder remain. Replace the TX output bandpass filter unit cover and its 7 screws. Replace the rig's top cover, not forgetting to reconnect the loudspeaker lead to connector "CN507" on the small circuit board connected to the front panel by a white ribbon cable as you do so. Take care not to scratch the paint when replacing all 11 screws. Fit the coaxial socket to the free end of the miniature coax. Check the results. Reconnect the rig and turn it on. Confirm that it receives properly. Try transmitting briefly to check that the RF output level is normal. Connect an external receiver using a coax patch lead between the new socket and the antenna socket on the receiver - NOTE: be especially careful if using a transceiver as the external receiver that the second rig cannot transmit. Preferably, disable the transmitter completely. 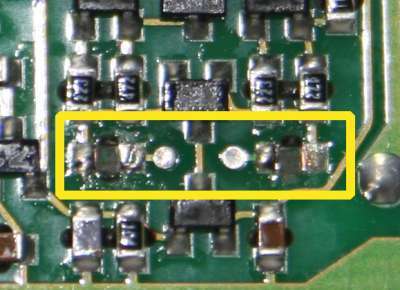 RF POWER ABOVE A FEW MILLIWATTS ACCIDENTALLY APPLIED TO THE EXTERNAL RECEIVER CONNECTOR WILL INSTANTLY BLOW THE TS850'S RX INPUT CIRCUITRY AS THERE IS NO PROTECTION IN CIRCUIT! !! Well, that's it. Mod complete. Now all you have to do is figure out how to make use of two simultaneous receiver signals, SO2R-style, without getting totally confused! By the way, although the external receiver's antenna is automatically disconnected when the TS850 transmits, there will still be plenty of RF in the vicinity - it is probably best to avoid tuning the external receiver to the TS850's transmit frequency, possibly even the same band, or to use an external band-pass filter in the receive line. Whilst the TS850 is not powered-up, the operating parameters (i.e. the setup menu settings) and memories are retained by a few microamps of current from a 3V battery on the control board just behind the front panel. With such low current, the battery lasts for many years (mine were well over 10 years old before I finally got around to changing them) but there is an increasing risk with age that the battery will leak, causing corrosion damage to the circuit board, intermittent tuning and perhaps an expensive replacement job. So, if you have a TS850, NOW is a good time to change the memory backup battery. Unfortunately for us, the original battery was soldered directly in to the circuit board - designed- and built-in obsolescence. It had three connection legs welded on to the battery. Kenwood presumably did not anticipate the need for the battery to be replaced before the rig expired, but we have other plans. It is A Good Idea to install a battery holder, although I found it impossible to obtain a suitable holder for a direct replacement battery in the UK. The following instructions explain how to adapt a similar holder available from electronics supplier Maplin (www.Maplin.co.uk). A ‘proper’ battery and holder is evidently available in the States for $4 from www.farcircuits .net/control1.htm according to a hints and kinks column in October 2004’s QST. Proceed at your own risk! This mod could all go horribly wrong! Take great care! If you are not cure about un/soldering bits, don’t even try it! On the other hand, however, what have you got to lose? If your original battery remains unchanged, it will eventually fail and may well leak all over the circuit board, causing a far more risky/costly procedure. You might like to take your radio to a professional radio engineer (especially a qualified Kenwood technician), to a proper radio amateur, or else to someone who ‘does radios’ at your local radio club. Don’t blame me if you break your radio!! I have modified both of my 850s using this procedure without mishap. Don’t be unduly worried by the length of these instructions - they are very detailed to help those not used to fiddling about with their radios, but the process is actually pretty straightforward. It takes about an hour I guess (plus or minus tea-brewing time). First, make a note of your radio’s operating parameters and memories just in case you need to re-enter them later (you probably won’t need to). If you don’t know how to read your memories, give up now: this is all too difficult for you. To read the operating parameters, follow the instructions in the operating manual (“Power on function selection”, page 35) to display the options menu i.e. turn the radio off and press the LSB/USB button while you switch it back on. Turn the M.CH knob to step through the settings and read the display. Press CLR or switch the radio off to exit the options menu. The Maplin lithium battery holder I used is not designed for the battery I used, but can easily be modified to suit. The Maplin part is slightly small for the battery I chose, but it has an open construction. There is a small (0.5mm) plastic lip around most of the circumference to hold the intended battery in place. With the craft knife, carefully trim away the plastic lip, leaving the main block holding the spring-loaded conductor, so the new battery will lay more or less flat against the base of the holder. The plastic is not hard to shave away if you are careful but try not to chop parts off your anatomy. Also, the spacing of the contact wires is a little off the holes in the circuit board - I bent them slightly to fit using snipe-nosed pliers, but you may be able to ease them into place without bothering (you will soon have the board out ready to check the spacing ... step 8 below). Have a cup of tea and re-read the rest of these instructions. Completely remove the top and bottom covers of the radio. This is simply a matter of undoing the little silver crosshead screws: four on the top panel (two at the front edge and two at the rear plus one near the middle - don’t touch the four around the loudspeaker grille) and eleven in the bottom cover (three each side, two at the front, two at the rear and one about 5 cm behind the tuning knob - don’t touch the two holding the flip-down panel). Keep all the screws safe in a little container. 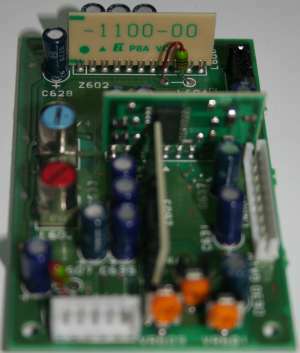 The loudspeaker on the top cover is connected to a circuit board on the top of the radio by a flying lead and white plastic connector - pull this connector out of the circuit board using a bit of gentle persuasion with the snipe-nosed pliers. Place the top and bottom covers safely aside, somewhere where they will not get knocked or scratched. The top of the front panel of the radio can now be carefully swung out, down and angled away from the body of the radio after you remove the two top screws, one on each side, holding it in place. You may need to loosen the lower screws a bit too, but don’t remove them. I had to place my radio at the edge of my workbench to avoid the knobs fouling the bench when fully swung. You should be able to see the old battery you are going to change - it’s the 1.5 cm diameter silver disc on the circuit board now at the front of the body of the radio, roughly behind where the number keypad area on the front panel was before you swung it out of the way. You need to remove the circuit board holding the battery completely from the radio - don’t even think about unsoldering the battery from the front, it’s really not worth the hassle. To do this, first remove the connectors around the circuit board - this means using the snipe nose pliers again and/or fingers to ease the flat ribbon cables from the push-fit connectors on the board, and to pull out the few plastic connectors. Try not to pull the other ends of the ribbon cables from their connectors, and try not to touch the exposed ends of the ribbons as it will only make the radio less reliable in future. Make sure you have disconnected all the cables from the board. Don’t worry about labelling the cables unless you are really paranoid - it is “obvious” where they go (obvious to me anyway!). Remove the screws holding the circuit board to the radio chassis. There are about six screws I think, all of which were very tight on my 850’s. Use a good crosshead screwdriver of the correct size (quite small), and apply a firm pressure to avoid buggering the screw heads, scratching the circuit board or stabbing yourself in the process. Lift the circuit board out of the radio. Move the radio somewhere safe to give you room to work on the circuit board. Have another cup of tea while your soldering iron heats up. Check visually whether the old battery has leaked already. Look for signs of corrosion around the battery area (usually whitish crystalline deposits) - if so, you may be too late. Here comes the trickiest bit of the job. Carefully de-solder the old battery from the board. The battery has three connection/support legs plus a square of double-sided sticky foam holding it to the board. The technique I used was to apply heat to the appropriate connection pads at the rear of the circuit board one leg at a time whilst gently levering the relevant area of battery away from the board using fingers or a screwdriver. Bit by bit, each leg will eventually spring free and you can pull the battery away from the sticky foam. Make sure you are heating the correct pads or you won’t get anywhere, and you may damage the board! Once it’s out, put the old battery aside - you might need to double check the polarity or impress your pals at the radio club with your daring tales of fearless radio-modding. If the old battery has leaked, make an executive decision whether to continue working on the board in the hope that you can recover it or else cut your losses and replace the board now. If you decide it is worth recovering, clean away the deposits with a damp cloth and check if there are any signs of damage to surrounding tracks and components. Remove any strands of foam that remain and carefully observe the connection pads on front and rear of the board. You will probably need to clean up any odd blobs of solder that remain, and you need to make clean through holes in at least two of the connections - either using a solder sucker or solder wick, or else by melting the solder and quickly blowing a puff of air through to form a clean hole. It may take a couple of goes, so be patient but be careful not to over-heat the pads, lift the track from the board and get great blobs of molten solder all over the place. [Hinson tip: avoid at all costs flicking molten solder up your nostrils or in your eye. It really stings. Trust me, I know.] You should end up with one positive and one negative through hole connections. Offer-up the new battery holder to the board. You should find that the holder is a fairly tight fit but can be gently persuaded gently into place with the help of some pointy-nose pliers and a little swearing. Make sure it is the right way round! The holder’s spring clip should end up below one edge of the battery when the radio is all back together at the end (assuming you operate the radio sitting horizontally on its feet!). Solder the holder in place, applying just enough heat and solder to make a good connection. Check that the solder flows through to both sides of the board. Admire your handiwork and have another cup of tea. Replace the circuit board in the radio and secure it with the six (?) screws. Replace all the cables and connectors in the connectors from which you removed them. You may need to ease them into place with the snipe-nosed pliers, especially those on the bottom edge of the board, one of which cables lies underneath another (you will probably need to work with the bottom of the radio uppermost for that bit). If, like me, you forget one of them , the radio will not work properly at the end and you will need to dismantle the case again to find out why - save yourself the grief and double-check it now. Every connector on the board should have a cable attached. While you’re at it, check that the other ends of all the cables are still attached too. Slide the new battery into the holder, making sure to place it the right way round. [From memory, I think the +ve side faces the keypad and the -ve side faces the circuit board but don’t quote me on that. Sorry. I forget.] Try to avoid touching the flat faces of the battery with your fingers throughout this process. Swing the radio front panel back into place and refit the two screws. 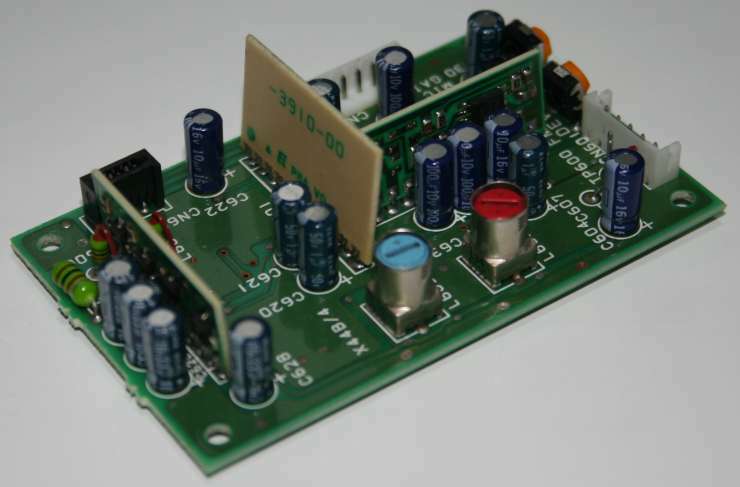 Replace the front and bottom panels of the radio, not forgetting to replace the loudspeaker connector on the circuit board on top of the radio (underneath the little flap on the top cover) . Replace all the screws. Check that your pot is empty. If you have bits left over, apart from an old battery and a few solder blobs, you probably forgot something. Go back several steps, do not pass go, do not collect £200. Connect up the radio power lead to your 13.8V supply. Turn it on. Check that the display lights up as normal and that the front panel controls work. Listen for some white noise. Connect an antenna or dummy load and check that the radio transmits (put it in AM/FM mode in an amateur band and press the Rec/Send button or the PTT on your microphone). If it all works, treat yourself to yet another cup of tea. You’re almost finished. Last step: put an entry in your radio notebook, diary and/or in the operating manual to replace the battery every few years - I’d suggest somewhere between five and ten years maximum. With the holder in place, it is now a simple matter to remove the top cover, slip out the old battery and slip in a new one. Think of me and smile as you do it! If you were unlucky, the old battery was practically dead and you took too long to complete the mod, in which case the radio will have lost all its operating parameters and memories, and maybe corrupted the microprocessor’s operating system. Don’t flap, they are easily reset using the procedures in the operating manual and the handy list you took earlier. The microprocessor operating system is safely retained in a ROM. It is probably a good idea to reset the radio’s microprocessor, again using the procedure in the manual (page 37). If the radio still doesn’t work properly, take the covers off and treble-check your work. Make certain all the connectors are firmly fitted in the correct positions on the board you removed, especially those fiddly flat multiway cables, and check the other ends too. If you are STILL out of luck, please don’t call me. Call a proper radio engineer, buy a new board or junk the radio. Remember, you have been warned . By the way, the battery backup is disconnected when the rig is powered and switched on, thanks to a power monitor chip IC23. In other words, the more you use the rig, the longer the backup battery will last. Don’t leave your 850 unloved and sulking in a box - it likes being used. 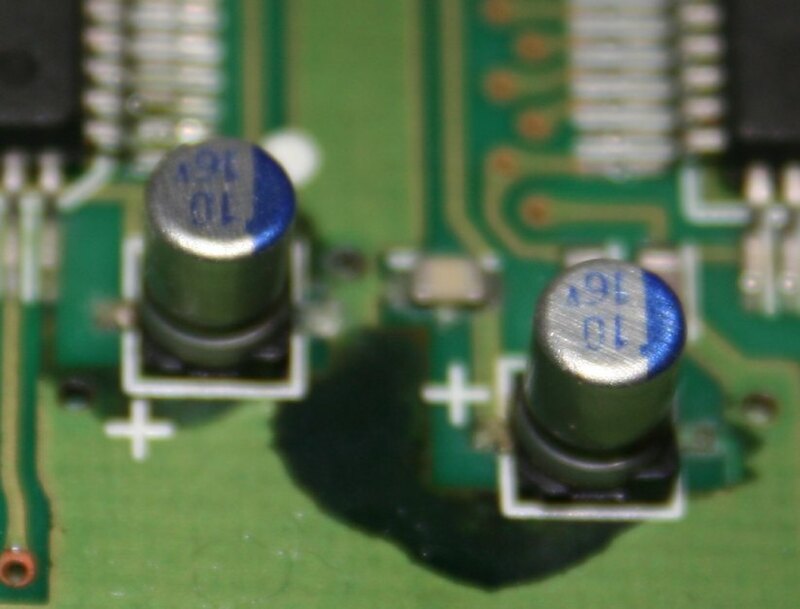 Problems with the electrolytic capacitors on the carrier oscillator board on older TS850s (see above) have been surfacing for a few years. During CQ WW CW 2007, it was my turn - or rather Phil’s. The main station TS850 was working fine for me on 80m but the other one failed when Phil set up the second operating position for him to continue working 15m. The electrolytics leak their electrolyte, corroding the PCB and losing capacitance until the board eventually packs up for good. The dark stains below show the creeping corrosion close-up. Nasty. I was lucky: I had a spare CAR board in a third TS850, bought as a junker a few years back. It was an easy fix to just swap the boards. The junker must have been a more recent radio since it has the second run of ICs on the board, denoted by an extra “2” on the IC number (it seems some early ones had IC problems too). If you have a TS850, I’d recommend popping off the top lid, removing the shield/cover over the CAR board (far left corner if the rig is facing you like normal) and checking that CAR board for damage NOW before it’s too late. 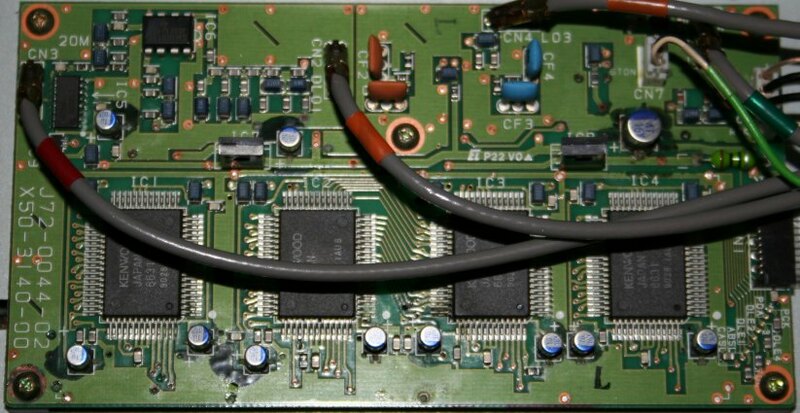 If it is an older board with 6631 chips (not 66312’s), check all the electrolytics carefully. It’s not too difficult to replace them with similar sized replacements but don’t wait too long or the board may be irreparably corroded before you get to it. Assuming everything is OK, it’s probably worth checking the memory backup battery (see above) and realigning the rig while the cover is off. The main oscillator board is easy to check for frequency accuracy (against WWV) and VCO voltage swings (with an accurate multimeter). The latest problem with my TS850 came to light while working 40m CW as usual one evening. I noticed the RIT/XIT frequency display flickering unusually and the power meter showed the output varying seemingly at random by about 25%. While I was calling a JD1, a ZL (presumably) came on to tell me I had bad chirp. I sent TU and went QRT immediately. Shortly after, my pal Paul ZL4PW emailed me a short audio clip of my horrid chirpy/raspy signal so I knew something was definitely wrong somewhere! Hunting the web for clues, I found other hams reporting problems with the ALC cycling up and down over a few seconds. They blamed the problem on the little DC-DC converter board failing to generate a stable -6.2V level for the ALC, for some reason. It’s a multivibrator circuit that some say ‘loses lock’ i.e. stops multivibrating with low supply voltage. The DC-DC board is the vertical daughter board on the left of the X44B/4 board shown above, located more or less under the loudspeaker on the top front left side of the TS850. The first thing I tried was to replace the whole X44B/4 board with one from my junker TS850. Unfortunately, though, the junker appears to have had the same problem, or at least someone seems to have unsoldered and resoldered the daughter board at some point. Anyway, the replacement board stops the RIT/XIT display flicker but still the power level is unstable: I notice when I first transmit, the power peaks around 100W before settling quickly back to the 50W level I normally use to drive the linear to 500W out. Not good news, but it seems to work for now. The ALC meter is hard-over most of the time when transmitting, unless I turn down the CAR control. That doesn’t seem right either. Anyway, on air testing indicates that the signal is Q5 so at least I’m making some progress! In close up above, you can see the daughter board’s surface mount components and, in front of it and to the right, 4 x 33uF 16V electrolytics on the main board (Cs 624, 625, 626 and 628 reading from left to right in this view). The capacitors look OK - no signs of the leaking electrolyte that stains the CAR board anyway. Note that the daughter board is soldered in place without an edge connector. 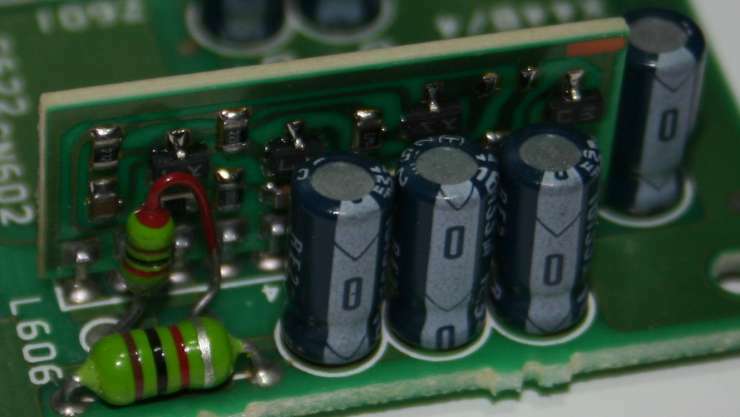 With the capacitors and coils so close to the component side, it will be tricky to dismount and remove the little board for fault -finding or fixing. Looking from the other direction (see left), the daughter board marked -1100-00 at the far end has just one coil near its back side. It’s possible to fold that coil down towards the board and tilt the daughter board over backwards just far enough to measure and if necessary solder it. Unfortunately in the course of doing this, I let the smoke escape from that little 1mH choke L606 shown here by neglecting to remove the +13.8V supply from the board and shorting it to earth through my soldering iron (doh!) so I had to replace that too ... I hope all the smoke is still locked in the remaining components! No sign of ringing now, though the slow up-ramp still puzzles me. The final smoke test was to put it back in the rig. It all seems to be working fine so, fingers crossed, looks like it’s fixed. While I had the X44B/4 board on the workbench for the ALC repair, I took the opportunity to remove two SMD capacitors from the noise blanker circuit. 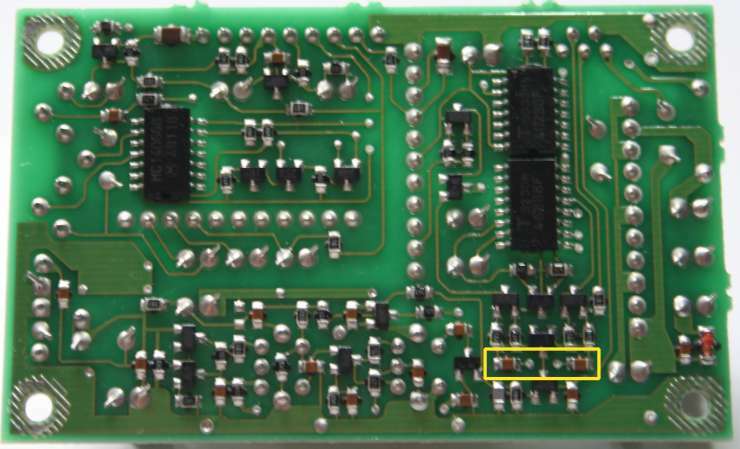 The image above shows the underside of X44 before the mod with the two capacitors marked in the yellow box. A few seconds heat from the soldering iron was enough to melt the solder and soften the glue holding them in place, so they just slip away. The close-up at right shows the remaining messy gaps after they’ve gone. While I had the covers off, I decided to have a go at a simple mod from Tree N6TR to make the CW sidetone level controllable from the MONI control on the front panel. I’ve been wanting to do this for years but didn’t get around to it until today. When operating full break-in, for example, I find the normal sidetone level too loud as it masks callers. Remove all the leads and lay the TS850 upside-down on a clean workbench. Remove the bottom cover and locate the IF unit. 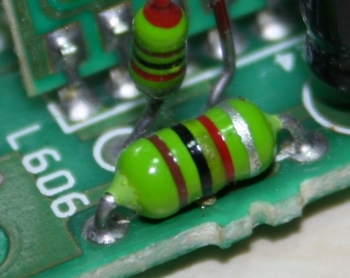 Identify and remove the surface mount resistor R239. Just heat it with the soldering iron and it will slide away. Twist together then solder one leg of each of a 330k ¼W resistor and a 0.1µF disc capacitor. Trim away any excess wire from the junction. Trim the capacitor free leg to about 4mm and the resistor free leg to about 10mm. Tin both free legs with a little solder. Solder the free leg of the capacitor to the centre pin of VR5 (marked VR5 STON). Carefully position then solder the free leg of the resistor to the surface of the through-hole plating pad near the IC (no need to poke the wire right into the hole). Apply power to the rig, plug-in a paddle/keyer and set the rig to CW on MAN (not VOX). Turn the front panel MONI control to maximum. No need to press the MONI button - in or out makes no difference to the sidetone. Set VR5 for the loudest comfortable sidetone level without excessive distortion. The voice memory keyer option for the TS850 is very useful in SSB contests and DX pileups, but reaching over the operating table to tap the little front panel buttons on the rig soon becomes tedious. I already had a remote switch box to trigger the CW memories in my Morse Machine and decided to adapt the box for dual service as a remote controller for the voice keyer in the rig as well as the CW keyer. The control lead requires a 3.5mm mono plug at the rig end, a length of shielded cable (thin coax), plus another mono plug and matching socket to connect it to the control head. Inside the control head, the resistors are wired between the switches and the 3.5mm socket, ignoring the existing wiring to the 5-pin DIN lead for the CW keyer. The 5-pin DIN at the left and rainbow wiring is for the Morse Machine. The hodge-podge of resistors from my junk box and 3.5mm socket to the right is for the voice keyer. It’s not pretty but it works . All that it took to finish off was a new set of labels with the voice keyer legend above the keys in yellow and CW legend in white below. 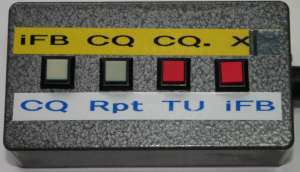 I have two CQ messages on voice, a short one and a long one, and my call recorded once (used for search-n-pounce and in pileups). The voice memories are queued with each button press, and shown on the TS850 display. The CW messages are not queued by the Morse Machine and there’s no need for a stop key because a tap on the paddle stops it dead. POSTSCRIPT: I subsequently discovered that the added resistor network messes up the MM3 triggers for the middle two buttons: when either the CW memory 2 or memory 3 buttons are closed, the MM3 receives a short on the relevant control line but also a low enough resistance on line 1 to trigger memory 1 instead of 2 or 3. Grrrr. Back to the drawing board on this bright idea. And NE0X Ron had a failed inverter on the display board. He bought a short ?5 inch? cold cathode bulb and inverter for about 15 bucks from a local auto store. Fitting it was “a very easy job” he says “and hundreds cheeper than Kenwood”. I like the sound of that! If you are interested, visit the excellent mods.dk site for a bunch of other TS850 mods (though you’ll need to subscribe now to gain full access to the site). There are more links on my links page. In around 15 years use (99.5% CW, lots of CW contests), I’ve not found it necessary to make any mods or fixes other than those above plus a pair of IRC 400Hz filters on my TS850’s but your mileage may vary. It’s remains a superb contest-grade radio.